It’s hard to believe the baby is almost two weeks old. We’ve been having to work a little to adjust as SC has some day-night confusion. This is not new to us as MJ had it as well, but that was almost seven years ago now and not only were we younger as we were operating on less sleep, but there also weren’t any other kids at that point. I am surprised with how well the three older ones seem to be sleeping through the night, considering how they act during the day if they hear the baby cry. Once she starts to fuss even a little bit, at least one will shout “the baby!” and run down the hallway to rescue her from her bed. SC is indeed a lucky girl, with a big brother and two big sisters who love and adore her so much. My heart is full. I am one happy mama. Lately, my children, MJ and Q, have been waking up early – between 3am and 4am early. On top of being exhausted, I have been feeling poorly and that just exacerbated the situation. I made the decision to stay home from the dinner and I am glad that I did as I did not really start feeling better until this evening. Now, it is after 10pm and I am finally feeling better – like I want to move around and do things – only it is time to start thinking about bed if I ever want to catch up on sleep. Hopefully my children will start sleeping normally again so everyone in the house can start feeling better. MJ loves his new sister, but ever since she has been home, I find him fighting his naps. I do not know if he is growing out of them or if he just does not want to sleep because he may miss out on something. The other day, after my giving up on putting him down for a nap, I let him go about his business. I knew he was playing with his trains since they make a very distinctive noise as he bangs them together. Shortly after, I heard silence. In a house with a toddler, silence is never a good thing. 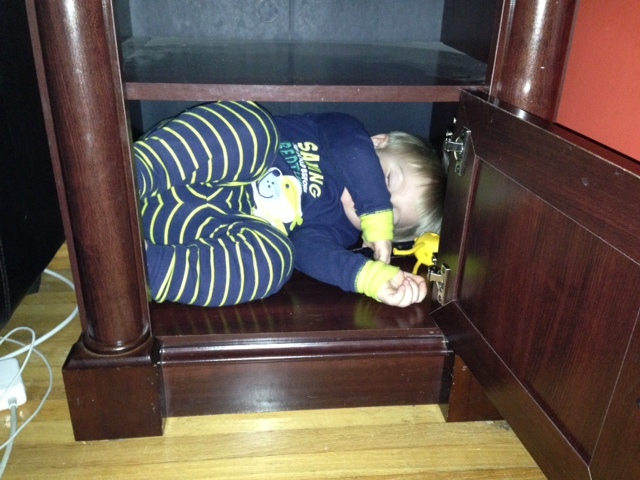 He was inside an end table in the living room with the door shut. Once I found him, I left the door open because I was paranoid he would not be able to breathe in there. He continued his nap in this space for almost an hour. When CJ got home, he was impressed that MJ was able to get comfortable enough to even fall asleep. He sure is a crazy boy, my MJ, and I love him to bits. As Q takes one of her many naps, MJ and I finally had a chance to return to a semblance of our normal schedule. We have done our flashcards and had our dance party already this morning. I also excitedly realized that I can once again sit comfortably cross-legged. One of my girlfriends suggested I occasionally use this blog for a “mommy and me” type of thing and there is something that I think may be worth discussing. When I had MJ, we had a difficult time with feeding at first. Whether the issue was with latch, suction, who knows- we were not always successful. By the time we got a hang of it, he was eating a lot and eating well. Because this is the last feeding experience I had, I found myself comparing Q’s eating to MJ’s. Q and I fell into feeding like old pros, but she was spitting up a lot. It took me a few days to realize that I was grossly overfeeding her as she could not really process the amount of milk her brother was eating at five months old. I have since been adjusting the amount of time she eats for, but now I fear that she is not getting enough as she is a peanut compared to her brother. On a brighter note, CJ and I figured out what Q’s problem was at night (which way she faced in the bassinet and temperature of the room) and since we have addressed both these, she slept through the night last night! I made CJ get out of bed a few times to check if she was still breathing because she seems awfully small to be sleeping through the night, but I was also grateful for my first full night of sleep since she was born. Today, CJ and I had to drive to the city to sign our closing papers. That is right! You read correctly. We are now, finally, homeowners. While we were gone, my cousin watched MJ for us. She absolutely adores him and bonus – does not charge 🙂 She was snuggling with him when he fell asleep for his afternoon nap so her nineteen year old self could not ignore the photo op. She took a picture of the two of them cuddling and posted it on Facebook. Being the proud mama that I am, I commented saying, “Custest baby ever.” Obviously he is mine and I would think so. My sister, being her ever callous self and having no social filter had commented, “I beg to differ.” It would have been less rude if she meant that she was partial to her kids, or something along those lines, but that was never stated; just that she “begged to differ.” My son was not cute whether it be only in the picture or in general. I feel like I should not have to constantly remind myself that she has no filter and that she does not always mean what she says as she does not think before she speaks. She is an adult with two children and one of the way. Is it crazy for me to expect her to grow up, act her age, and practice good social graces?